A father-of-three who knocked down and killed a much-loved Co Tyrone student after consuming at least 13 drinks was handed a seven-year sentence on Wednesday. Judge Gordon Kerr QC told David Lee Stewart that his behaviour on the night he killed 18-year old Enda Dolan was “appalling”. Belfast Crown Court heard of the devastating impact Enda’s death - which occurred on his sister’s 16th birthday - has had on his family and friends. Following her son’s death, Enda’s mother Niamh has been diagnosed with Post Traumatic Stress Disorder. Stewart (31), from Grays Park Avenue in Belfast, drank at least six pints and five Jagerbombs before staggering to his car, getting behind the wheel and driving along the Malone Road. Traces of drugs including cocaine were also found in his system. Before he mounted the kerb and struck Enda, several witnessed observed Stewart’s van being driven dangerously. After striking Enda, Stewart continued to drive with the student on the roof of the vehicle for around 800 metres. 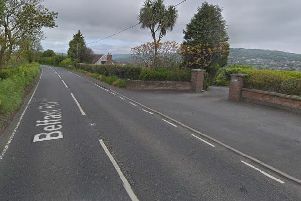 Whilst the Killyclogher man’s lifeless body lay on the road, Stewart and his passenger - William Ross Casement (21) from Belvoir Drive in the city - drove away from the scene but crashed again a short distance along the Malone Road. The court heard that Stewart - who had to be cut out of his van after crashing into a lamppost - refused to give a blood or breath sample, but when the test was eventually done, he was found to be three times over the legal limit. Stewart also told police he had only drunk two pints of shandy whilst watching a Northern Ireland football match - but he later pleaded guilty to five offences including dangerous driving causing the death of Enda. He was handed a seven-year sentence and was informed he will serve half the sentence in prison, with the remaining three and a half years spent on supervised licence upon his release. He was also disqualified from driving for five years. His co-accused Casement, who had been drinking with him in the hours prior to the crash and who was a passenger in the van, admitted two charges linked to the fatal collision. He pleaded guilty to aiding and abetting dangerous driving, and of aiding and abetting failing to stop at the scene of an accident. It was the Crown’s case after Enda was carried on the roof of the van, the vehicle came to a stop. As Enda lay on the road, Casement got out of the van. It was the Crown case that Casement must have known Enda was, at the least, very seriously injured as he stood close to him. He then got back into the van and encouraged Stewart to leave the scene. He was handed a combination order consisting of 50 hours community service and two years probation. He was also banned from driving for 12 months. Enda, a talented first year architecture student from Co Tyrone, had just started Queen’s University and was making his way back to the Elms Village in the early hours of October 15, 2014 after spending the night with friends when he was struck by the van. He sustained fatal head and spinal injuries including a broken neck, and despite passers-by rushing to his aid, Enda was pronounced dead at the Royal Victoria Hospital. Judge Kerr Qc told a packed court that Enda’s death was a tragedy, and said “no sentence can ever reflect the pain and suffering of all who knew and loved this young man”. Branding Enda’s death as “senseless and needless”, Judge Kerr acknowledged the impact the fatal collision has had on the family. Judge Kerr also read from an article which was published in the Christian Brothers School Magazine in Omagh - where Enda attended and was a prefect - where he was described as a gifted musician, a hard-working pupil and a modest, down to earth young man.